The Quality system needs to be established by training and assessment organization for ISO 17024 accreditation of their system for operating person certification. Such system must comply with requirements for a conformity assessment for personnel certification as per standard published as ISO/IEC 17024:2012. The system documentation must be conforming to the requirements of the 2012 version and ANSI Guidelines that provide detailed information regarding the components that must be included in the development and maintenance of the scheme. Our ISO 17024 documentation kit can be used as an effective tool to learn and implement ISO 17024 documentation. The company needs to make ISO 17024 manual for ISO/IEC 17024 accreditation. We assure that, our packages are competitively priced and completely meet the user's need to make a good system and establish complete documentation for ISO 17024 certification system establishment. Sample ISO 17024 Manual (10 chapters and 06 annexures). Set of standard formats and templates for maintaining records (26 sample forms). 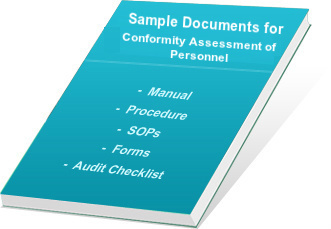 System policy, which guides to learn personnel assessment requirements. ISO 17024 Audit Checklist - to verify implemented system for personnel certification. Entire document kit is available in editable .doc format, so it is very easy to edit and create new document as per your organizational requirements. It is very well-written in simple English and all documents are compatible with Windows 1997 and higher versions. Many companies globally have documented their systems to meet ISO/IEC 17024 requirements, such as manual, procedures, records, policy, checklists, etc., and successfully completed certification. User can easily amend and change the templates as per their working system and create own quality documents for quick certification to ISO 17024. ISO 17024 manual, procedures and formats provided in document kit can help in fine-tuning the processes and establish better control over quality management system. Saves much time and cost in document preparation. It gives 100% value for money to customer. Ready to use documents in .doc format reduce your time in documentation process. Documents are useful in training to staff for learning of system clauses and requirements. Takes care for all the sections and sub-sections, gives better understanding and improves the system. ISO 17024 Documentation Kit helps in making total documentation including manual, procedures and quality ISO 17024 audit checklists for quick certification. On completion of purchase via secure third-party online transaction, we provide username and password to download the product from our FTP server. The delivery of our products will be within 12 hours of payment confirmation by secure third party payment gateway. Download free DEMO of ISO 17024 Documentation kit and purchase it with secure online transaction via Paypal.com.